I spent a little more time tweaking the arduino snail mail project today. First and foremost was getting the arduino to send emails. It's all well and good to get iOS notifications but neither of us have iPhones. While an iOS notification would be useful to Chris (he uses his tablet a lot during the day) it's not for me. I'd much prefer to get an email notification. So Chris wrote a little PHP code that send emails and I tweaked the arduino sketch to pull the PHP. Suddenly I was receiving emails! Next was getting an LED to light up when the snap action switch opened. 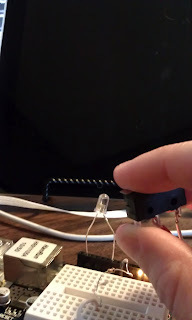 Initially I ran into an issue where I was using a pin already reserved for the ethernet shield, but once I plugged into pin 9 (instead of 10) it was smooth sailing. Now when the mailbox opens, the green LED will turn on (and stay on). I also get an iOS notification (as you can see in the background), and an email. 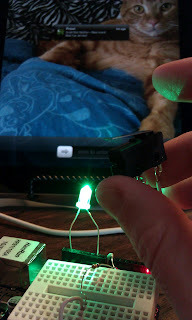 The next major bit I'm going to tackle is building in a timer for the LED. I'd like to have it designed so that when the mailbox first opens, the light comes on. Hours later when I come home and get the mail, the light is turned off (triggered by the second opening of the box). If you're wondering what the purpose of the LED is, its to work as a visual status indicator. The intent is to have this arduino project sitting in its to-be-created housing by the front door. Then, on the off chance that neither of us have checked email or used an iOS device recently, we'll see the green light is on and check the mail. Soon there will be no excuse to leave mail in the mailbox. Ever. Even if I wanted to. Of course there's still the issue with the wireless. I've been eyeballing those two WR703Ns I have but haven't worked up to messing with them.